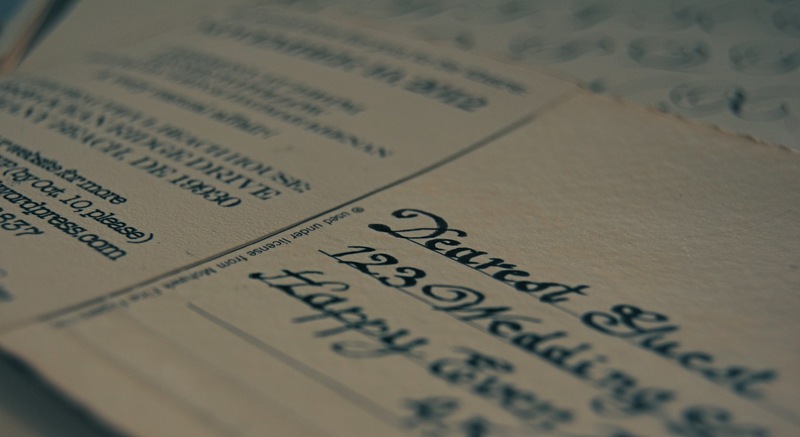 When one decides last minute to have a wedding, and in the wedding world two months is a last minute decision, it can be hard to get invitations printed and returned in time for your guests to rsvp at a reasonable date. 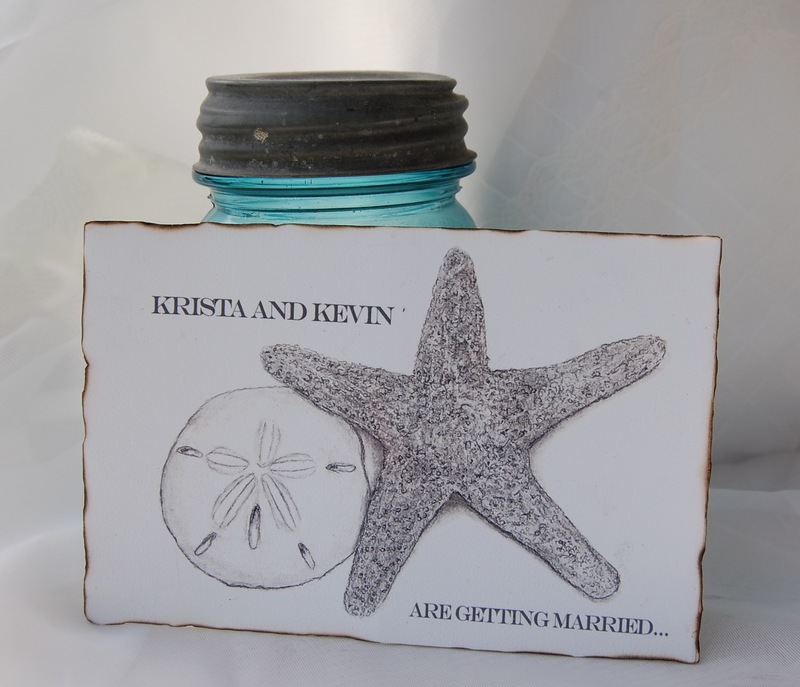 Besides, I browsed through invitations online and nothing was really calling to me, saying “hey- we are awesome beach wedding invitations totally worth the money you would spend to purchase me.” Nothing in the stores thrilled me either, something about the texture of the paper. We happen to have a fantastic number of computer programs that can do very creative & beautiful things. How hard could it be, I concluded, to just design my own? Now that could be because the minute we decided we would have a wedding, (instead of eloping as we’d been planning), I’d had an idea in my head of what my invitations might look like. At a trip to our local art store a while back, I had stumbled upon Watercolor Postcards by Strathmore… the intention being you paint watercolor paintings on them and mail to whomever. I had never gotten around to using them for anything (probably since I don’t exactly paint watercolor) but I couldn’t help but notice that their thick, beautiful paper would hold up nicely in the mail. Postcards seemed like the perfect low-key wedding invitation answer. Still pretty- less to fuss over. And kinda fun to do. No stuffing envelopes with littler envelopes & putting stamps on them, and waiting for them to return in the mail. With the lovely wedding blog I had quickly set up through WordPress, people could RSVP online or just call. With just twenty-five guests this seemed manageable. All of our intended guests were computer literate, or certainly telephone literate. With that in mind I had considered just emailing the invitation, but I wanted something a little more tangible, something that could be held in your hands. I guess I just wanted to create something pretty. I liked the idea of a simple black & white charcoal drawing for the front and that is a medium I work with. After briefly considering drawing each invitation, I snapped out of temporary insanity & realized I could reprint my original drawing. So, I drew my starfish & sand dollar. Then I scanned it & printed it a few more times on a textured paper from the art store. It printed just as I hoped. I used the postcards as a template to cut the paper to size. I played for hours in Photoshop trying to come up with great text for the back of the invite, only to print it and have it come out blurry. Why dear Photoshop is nothing ever intuitive with you for me? I was about to try to untangle the mess that is Photoshop’s & I’s mutual existence yet again, when my dear husband-to-be suggested I try Word. Word? For something elegant looking? Well- I have to say it worked. And a lot quicker, but that’s probably only because I understand Word a lot better. After I printed side two, I glued both sides on with Aleene’s tacky glue. I don’t know why, it’s just the glue I know & had & and was comfortable with. I smoothed it down with my fingers before applying & made sure to apply the papers carefully so there would be no bumps or bubbles. After they dried it was back to one of my favorite tasks, playing with fire. I took a lighter and very carefully ran the flame along the edges. I had a plastic pen on hand. If the card started to burn too much, I would use the pen to tap out the fire. This burnt the pen, so don’t use one you really like. I liked the effect best when I was able to get a real light singe along the edge of the postcard & papers. Then I glued a small piece of sheer ribbon across the bottom of the back of each card. When I had completed the cards, and stacked them in a pile, I quickly learned that burnt paper is the same as a burnt tree, which is… charcoal. The black smudges that soon marred all my delicate white invitations did come off with an eraser, but I didn’t want it to turn people’s hands dark, or get the invites dirtier in the mail. So, I carefully went over the edge of the burnt postcard with a paintbrush and an acrylic sealer I had bought for crafting a long time ago. After it dried, the problem was solved. I used my relatively pathetic memory of calligraphy classes as a child to copy the Edwardian Script from Word, and address the invites. I think the imperfectness just added to the charm. 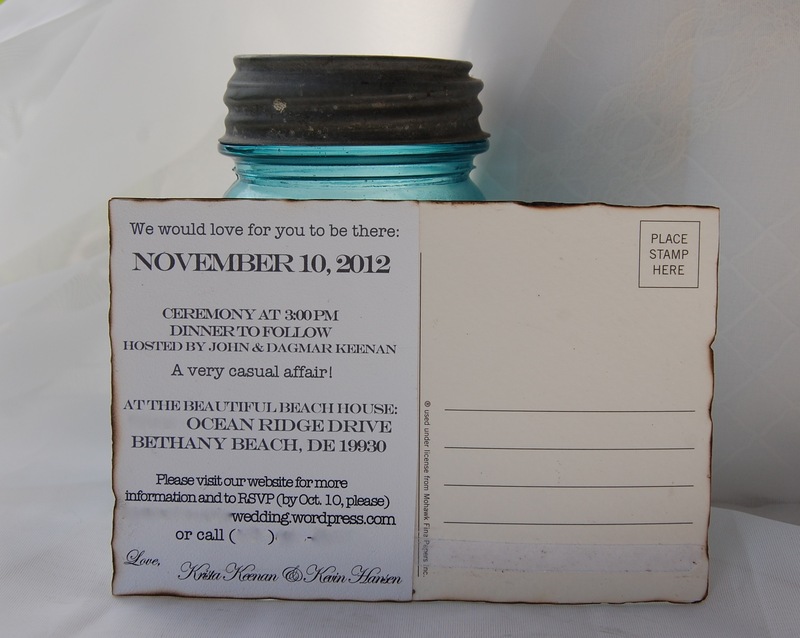 As far as I can tell, the guests seemed to like them, & everyone RSVP’d on the website or email, so good enough for me! When you make your own wedding invites, you get to really make them one of a kind. My art is so much a part of what I love to do; it felt great to share. If drawing isn’t your cup of tea, I’m sure there are many fair use images out there on the web you could use, and still make the invitations a reflection of your style. The possibilities are endless.